"The WOW tool is easy to learn and can bring data to the web quicker than any other that I analyzed"
Bay Corrugated Container, Inc. is a manufacturing facility that makes corrugated containers (boxes), as well as corrugated pallets. All orders are custom made. 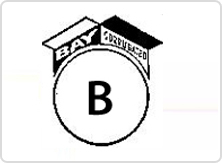 o satisfy new and current customer needs, Bay Corrugated Container, Inc. needed to bring an online ordering process to the web. 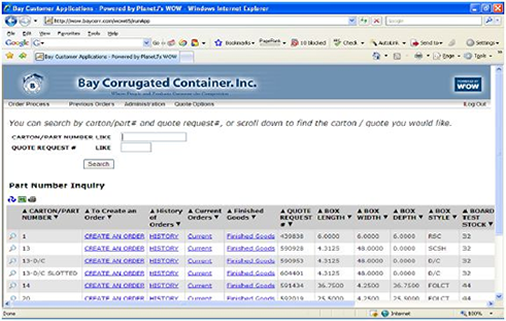 Bay Corrugated Container, Inc. currently has one developer on staff to manage and maintain the in-house ERP system and the EDI. This person does not have web development skills. 70% of Baycorr's software is written in-house using RPGLE. 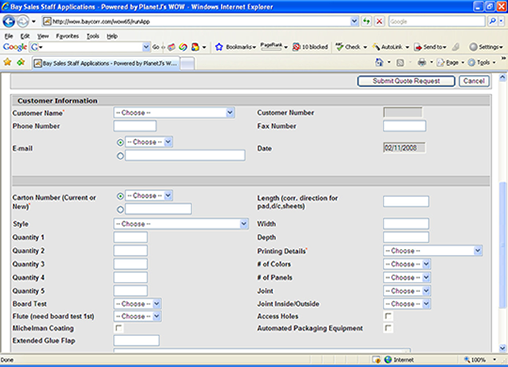 After evaluating several ways of implementing this online ordering system (including writing it from scratch by a contractor or a consulting business or purchasing competitor software), it was determined that PlanetJ's WOW software would be the quickest and most cost effective way to accomplish their needs. "PlanetJ worked diligently with me to create this online ordering system. This needed to be done quickly in order to acquire a new customer that was to bring a large amount of business to our organization." Carl Smith, Bay Corrugated Container. Also, added Smith, "Installation and configuration took minutes, a simple query bringing data to the web took only about 5 minutes and within a month, we had an integrated online ordering system available from our website." Below is a "Quote Request Form" used by the sales staff (and customers) to submit a request for quotes on the design of new carton (box) or change to an existing carton. The data filled out is directly input into the back end system so customer service can review it. The quoting department can then create and send the quote to the customer. There are also forms for "New Customers", "Cutting Dies," Print Plates", "Samples," and "Corrugated Pallets". BBelow is a picture of what a Bay Corrugated customer would see. 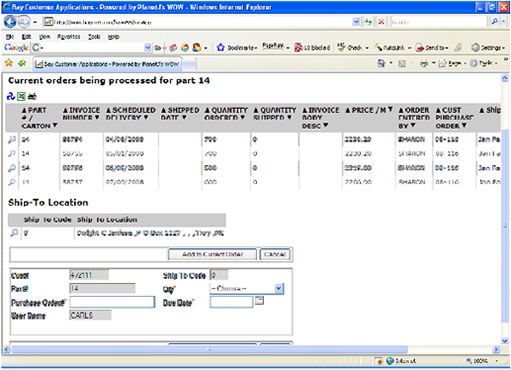 It lists current carton numbers and allows them the options of 'creating a new order', review a 'history' of orders, or check the status of an existing 'current' order for each carton number. "The WOW product has made it easy to bring our system data to the web. I've gotten many positive comments through our sales staff on how much the customers like the ability to use the website for on-line ordering and reviewing the open orders. We have developed many in-house forms using the WOW tool, and have put these on the website as well. When these forms are filled in by the sales staff, the data is directly input into our system, saving our customer service reps the time to take the form and enter the data into the system. This also helps with our ISO compliancy regarding form tracking; meaning there is only one place to get the form. When any changes are made to the form, everyone is automatically using the new form." Carl Smith, Bay Corrugated Container, Inc.